Over the years we have taken a number of photos of the wonderful Penfold Piller Box at Budby, Nottinghamshire. Even driving past on the A616 Worksop Road we have glanced up the Lane to see the box. Can you imagine what we felt when a recent email was sent to members of the Letter Box Study Group saying the box had been stolen! 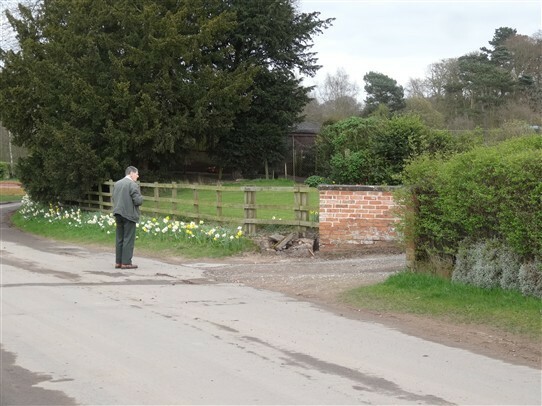 On Tuesday 4th April 2017 we went to Budby to investigate, and sure enough the box was gone and all that remain are lumps of broken concrete. On speaking to a local resident we learnt it had been taken overnight on the 3rd March. 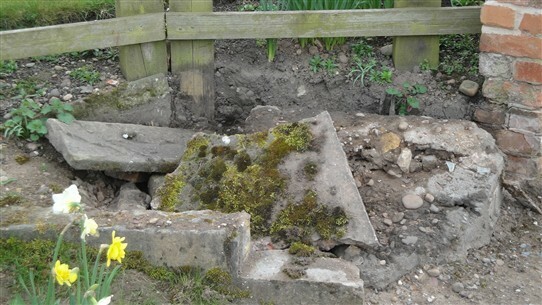 It would have required heavy machinery and transport to haul it out of the ground and move it, and in this quiet country village it is surprising that thieves were able to do this without being seen or heard. It has been suggested the box could already be miles away but who could want it more than the people of Budby and Nottinghamshire? This page was added by Pauline Marples on 10/04/2017. This page was added by Pauline Marples on 08/05/2017. I read that Budby is to have a new Penfold box to replace the current lamp box, and is expected to be installed on 21 March 2018. We have just been out to Budby and yes the lamp box has now gone and there is a new Pillar Box well and truly wrapped in black plastic, so it can not be used, despite this you can tell it is a replica Penfold. A local resident told us it was placed there a few days ago when the lamp box was taken away and they now have to go to Edwinstowe to post a letter. You could just see the base of the new Penfold and we suspect the box will need painting once it is unwrapped. I was both very sad, and extremely annoyed to see that this British icon had been simply spirited away like this. What I find hard to accept is that no-one ever appears to see or hear anything these days? If a large piece of street furniture like this can be stolen, then those locals need to make sure their cars and houses are well locked as this was a brazen act and shows complete contempt for all the values that we British hold dear. The moral being, keep an eye on your neighbours welfare and keep an eye on those hanging about or driving by. If they are genuine, they won't mind being asked what they are doing. A post box today, your car or valuables tomorrow. We suspect the new box needs painting and until that is done the post office does not want anyone to use it. We checked the box last Saturday and it was still wrapped in black plastic. it must be very frustrating for the people of Budby. 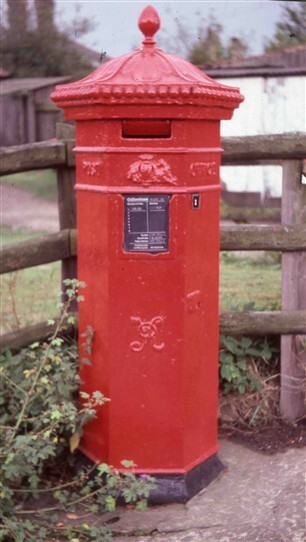 The people in Budby can once again post their letters in a bright red post box. Last Friday it was still wrapped in black plastic but yesterday we discovered it had now been painted and could be used. It was still minus a collection plate though so its not 100% back to normal.